Discussion in 'Apple iPad News' started by iDan, Apr 5, 2010. Hello my name is Dan and I'm an eBay junkie. If I'm not browsing a forum reading or posting messages, you can probably find me at eBay. From Gadgets to Camera Gear, to Cars, to Trucks, to ATVs, to Motorcycles I'm always looking for a deal. One of the first apps I downloaded today after receiving my unit was eBay for iPad. 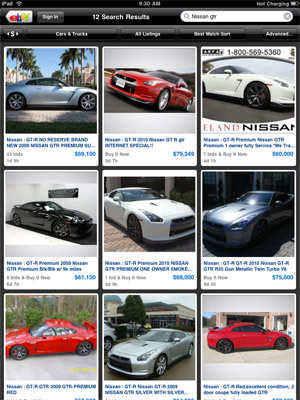 This new eBay application is designed and optimized specifically for the iPad and best of all, it's free. Once loaded, the first thing you'll notice is a clean and completely new interface displaying the daily deals. Using the search bar to quickly punch in a keyword, I was off searching for cars in no time. It quickly displayed items relevant to my search in a beautiful magazine style layout. From the results page, there is a top navigation bar that offers you a few more options to narrow down your search results. A couple of taps and my results were narrowed down to exactly the category I was interested in. While browsing through the car auctions, I felt more like I was browsing through an "Auto Classifieds" magazine with only much more detail. One click on an item lets you view the entire description, access the photo gallery, view seller feedback and place a bid. After using Ebay for iPad, I can honestly say this app combined with the portability of the iPad is superior to browsing on a desktop, laptop, or netbook computer. The eBay for iPad experience is streamlined, colorful, and simpler to use than ever before! It also features integrated access to My eBay that makes it easy for members to quickly check on an auction or monitor sales activity from wherever their iPad has taken them. Great review Dan, now I can see what type of cars you are looking at too. I wouldn't mind having a GTR but I hear they are really expensive to fix if you break anything! Does anyone have an insight to this pertaining to the seller section of this application? I do have something for sale on Ebay right now, the seller section does work acceptably, you can see how many watchers you have, how many bids and current price just as in a browser. You also, just like in a browser, have to click on the item to see page views. I have not tried to list an item with it, but I would guess it is not possible. The one major item that I noticed missing in the app comes from a buyer viewpoint though. Quite often I like to see other items someone is selling, that link is missing in the app. (Or I haven't found it) By making me go to my browser for such basic information, it kind of makes the whole app worthless to me. I am a very busy seller and my iPhone has given me the freedom to leave the confines of my computer, and be able to manage all of my sales, and most importantly, ANSWER buyer's questions which come into the eBay MESSAGES section of the app. SO, imagine how happy I was when they iPad version was released? I installed it immediately. But wait? Where are the eBay messages? What??? I have to wait for an actual EMAIL to come through, then I click a link, and I am taken back to the website (via the iPad) to answer? Well then, what is the benefit of having this app??? I am hoping that maybe I am doing something wrong or maybe I am just not seeing it? Anyone? Yeah, looks like another app which looks great on the first look and is not thought to it's end. Obviously it will take a while, until all app developers have "inhaled" Apple's developer guidelines. The iPad is a whole new animal, when it comes to development and user experience. I HIGHLY recommend anyone that is a serious eBay user and wants the ee of an app rather than the web to use it, to install the iPhone version on their iPad and NOT the super duper craptastic version for the iPad! Enough said. Have a fantastic weekend!!! I use eBay for 6 months and start selling products on it in first days all going well. Got couple bad feedback's from some idiots or competitions!!!!!! coz I know for sure I got a good product !!!!! PayPal close my account and say I own money for them 1500$ and get my money 1080$ after couple days I log in to PayPal and see there 500$ where money go? It's people robing for nothing? I left my credit info and now I have to pay my balance with eBay 660$ for what? Before my account put on hold I need only pay 247$ Scam stilling info and people who work for ebay get accounts info and use it.! I don't know what to do any advise? Take a small claims against Ebay and Paypal?